York JE, Young AJ, Radford AN. 2014. Singing in the moonlight: dawn song performance of a diurnal bird varies with lunar phase. Biology Letters online. Abstract. It is well established that the lunar cycle can affect the behaviour of nocturnal animals, but its potential to have a similar influence on diurnal species has received less research attention. Here, we demonstrate that the dawn song of a cooperative songbird, the white-browed sparrow weaver (Plocepasser mahali), varies with moon phase. When the moon was above the horizon at dawn, males began singing on average 10 min earlier, if there was a full moon compared with a new moon, resulting in a 67% mean increase in performance period and greater total song output. The lack of a difference between full and new moon dawns when the moon was below the horizon suggests that the observed effects were driven by light intensity, rather than driven by other factors associated with moon phase. Effects of the lunar cycle on twilight signalling behaviour have implications for both pure and applied animal communication research. Male White-browed Sparrow-Weaver start singing from their nests before emerging to continue their song performance in or near their nesting tree. 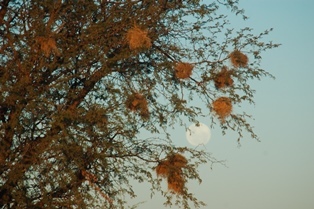 The authors studied the effect of the moon on the males' songs, between October 2010 and April 2011 from the colour-ringed population of sparrow-weavers at Tswalu Reserve, South Africa. Lunar cycles were classified according to moon position, ie. above or below the horizon at dawn, and moon phase, ie. new or full. Song start time, roost emergence time and song end time were recorded, only on mornings with no cloud cover, from 19 males during both a new moon dawn and the following or preceding full moon dawn. Previous studies of Tswalu sparrow-weavers include White-browed Sparrow-weaver thermoregulation, and Breeding in White-browed Sparrow-Weavers.